Jolly Christmassy with turkey and all that, and a rubber duck. 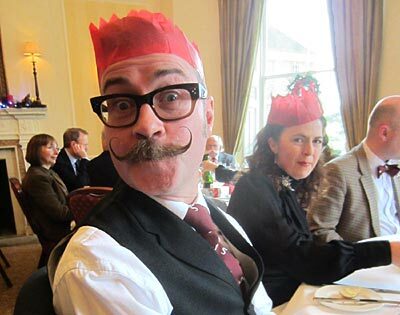 Dear Old Atters arranged this year�s Christmas lunch at the delightful Shelley�s Hotel in Lewes, East Sussex. Availing himself of the organiser�s prerogative, he was one of the last to arrive accompanied by the lovely Louise, squeezing into the hotel�s bijou bar, where serious inroads into the Harvey�s bitter, which was in tip-top condition, had already been made. There was a delightfully varied crowd present this year, including Rodders, Dame Judi, and Geoff, the Despicable Parsons and his delightful missus, esteemed orange-sexer Geoff White, Paul Lewis and Sarah - the newly �Mrs� Lewis, David Dade and John Gonezi, Glen and Jane Turner and baby Eliza, Martin and Liz Bennett, oh and loads of no-less charming others who I didn�t have time to natter to. I spent some time with one of Martin�s guests, a gentleman with a fine white beard by the name of Andrew Carslake (his name, not the beard�s), who is a Dickens expert, and adviser to many authors, museums and libraries. A fascinating man with a proper appreciation of beer into the bargain. In a thrilling new festive development Steve announced that the raffle was to be replaced this year by a single prize giveaway in the shape of a holiday at his Norfolk hideaway, donated by Rocky. 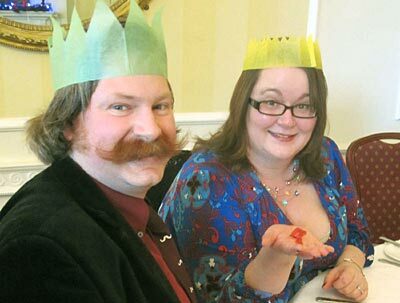 For a tenner, we each received a Christmas cracker, just one of which contained the winning ticket. We all pulled at once and Glen was the lucky man and Rod announced that we�d raised 230 quid for the Children�s Liver Disease Foundation in one fell swoop. The grub was jolly Christmassy, with turkey and all that, but some reservations were expressed on my table about the stupefyingly dense Christmas pud (more of a tarmac fairy cake in appearance). Keri gave up on hers and one diner requested a re-miking of his cold and leathery specimen. But nobody stormed out and the wine was delicious. After grub the gentlemen gathered around the grand piano to be photographed with a rubber duck (see top of page). Why, I don�t know, but life is made up of these peculiar diversions. 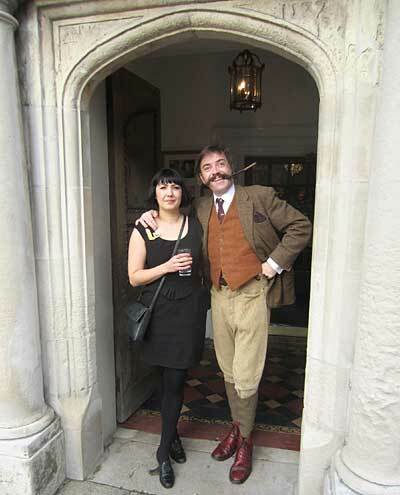 After convivial good-byes we dispersed to various homes and/or pubs. 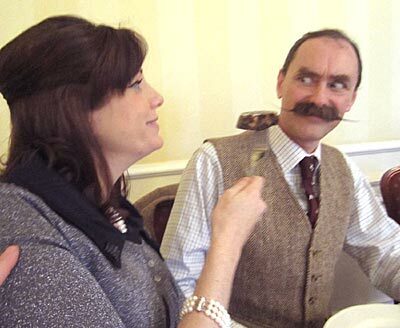 On the way out I noticed my tweed cap had gone AWOL, but it was discovered under a vast brown fedora on the table. I was relieved; that cap has been with me since I was just a little shaver.